(David Young, bestselling author of STASI CHILD and STASI WOLF). MOTHERLAND is the first in a gripping series of crime novels set in contemporary St Petersburg, featuring sharp and intriguing policewoman, Captain Natalya Ivanova. When the daughter of a Swedish billionaire goes missing in St Petersburg after a night out with a friend, Captain Natalya Ivanova is assigned the case but nothing is as straightforward as it seems. 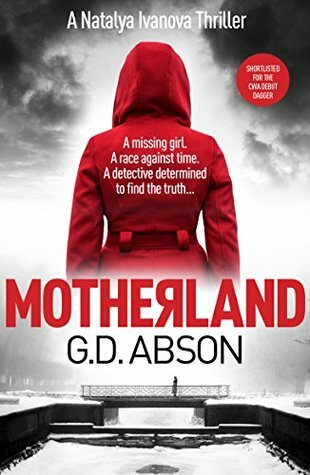 Dark, violent and insightful, Motherland twists and turns to a satisfying dramatic conclusion. I was so glad to see this was going to be part of a series. At first it was a bit difficult to understand all the names and nicknames of all the characters and I definitely did not know how to pronounce them. After a bit I just gave in and started using their nicknames which I do with my Russian friends anyway. I may have been at a loss with the names, but the core story is relatable in any language and I was eager to hear about life in Russia and what the police are like there. This is a fast paced police thriller that just felt real. The author’s writing style flowed easily from page to page while I bit my lip and held on for the ride. I can’t wait to see what come next for the detective and her family. I enjoyed meeting them all! Even the bad ones! HELLO SPRING, We’ve Been Waiting For You! added this to my list!